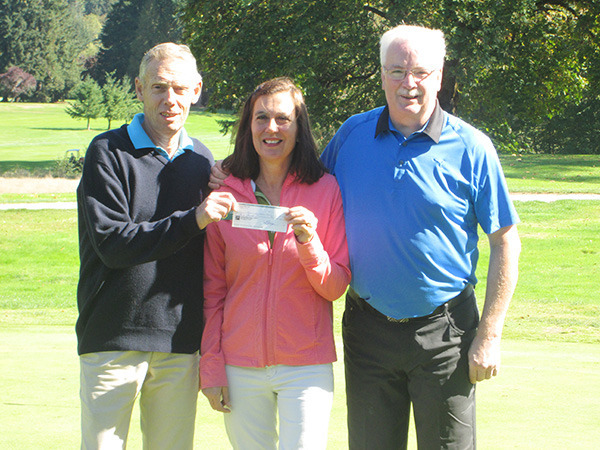 The Alberni Golf Club’s men’s league had a great crowd and great weather for the Mac Five Challenge held on Sunday. It was probably the highest number of competitors we have had at an event all season. Top honours went to the twosome of Paul Saulnier and Bob Vandermolen, followed by Phil Anker and Bill Barrett, Vic Carlton and Mel Trelvik, Fred Fredrickson and Mike Savard, Jerry White and Steve White, Jim Rhodes and Ron Barker, Lloyd Fairley and Gerry Fagan, Jacque Giovetti and Gerry Toms, Bill Johnston and Devin Cusson, Dave Mann and Steve Pointon, Bill Bjornson and Jack Sparks. Winning the final prize was the twosome of Wayne Johnstone and Masami Hirayama. Closet to the pin winners were, Tyler Ruel on No. 2. James Weening on No. 4, Bob Matlock on No. 13 and Clive Brown on No. 17. Club Captain Preban Rasmussen presented a cheque for $500 to Jenn Collette of Ty Watson House from monies raised through our Charity Closest to the Pin each week. That brings the Men’s Club sponsored events to a close, although we will continue to have non-sponsored events. Below, club captain Preben Rasmussen, left, with head professional Bruce MacDonald presents Jenn Collette of Ty Watson House with a cheque for $500.